Does anyone know when West Tacoma News Print/Boise Cascade went out of business? Way back in the day, about 1977 to 1980 I was decking on one of the small two man log boats in Tacoma. 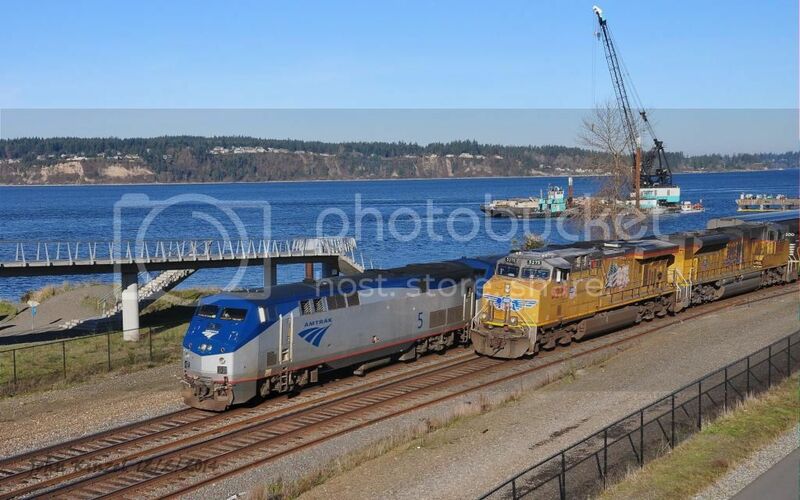 Dispatch had us run lite to Chambers Creek and relieve another larger tug of a log raft for West Tacoma News Print located about a quarter mile inside the bridge. There was just enough water for us to get the raft through the bridge and get back out. From that point a mill boat took the raft the rest of the way. That time and this past June are the only times I can recall seeing it open. It has been several months since I have been to Chambers Park and I was a bit surprised at what I didn't see when I arrived. The Glacier dock was completely gone and the Pioneer dock is 99% gone. It's sad to see them go, but it's all in the name of progress, or so they would have us believe. UP 5275 stopped short of the pedestrian overpass for a red signal and about five minutes later the Coast Starlight passed by. Then the UP proceeded and crossed over to main one at Pioneer. 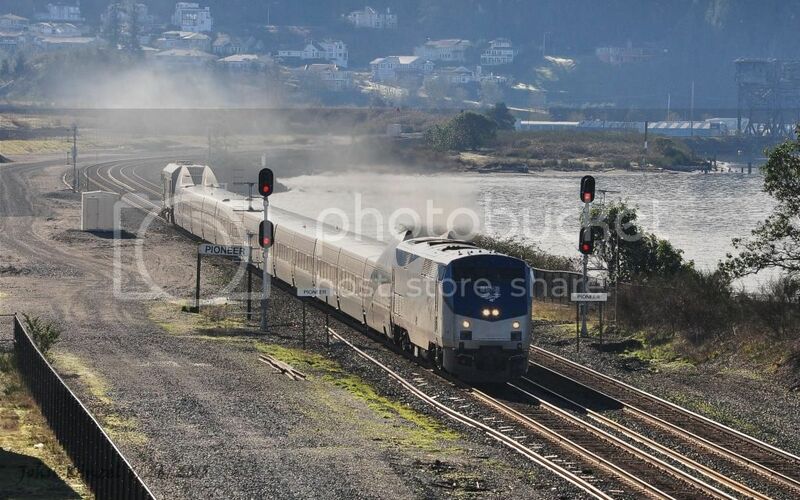 There was a cold stiff breeze blowing and no place to get out of the wind, so after getting the UP and the Coast Starlight I went to McCarver St.
Another NS unit. 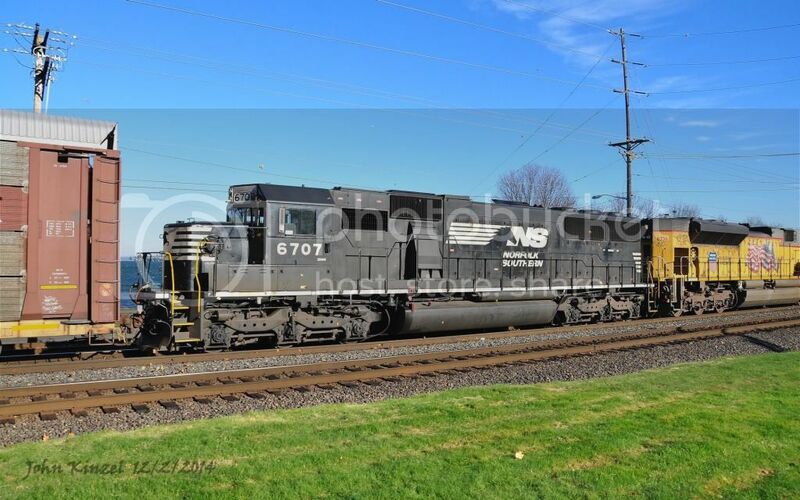 Interesting that the car behind NS 6707 is a Conrail autorack as 6707 is ex CR SD60 6852. Here's one for Bill, DPU 5959. Nice work, John. I especially like the AMTK and the UP together. Your pictures at Chambers Bay are always special. I think I have a shot or two of bridge 14 open, but it is definitely rare. Dang, that bridge is crazy! Based on an early Erector Set model. John, did you notice the track/grade work looking south from the bridge? The raised access road next to the Pioneer signals has been graded down level. Also, further down toward Bridge 14, grade had been built for a couple new tracks which I assume will hold BNSF's business train for the US Open. I'm only about 6 to 7 weeks late getting back. Yes, I noticed everything has come to a halt. Are they going to do anything with it or just write it off? Having been stuck in the house for more than a week with the flu (yes, we got a shot)and starting to feel better by Sunday evening, I decided Monday would be a good day to go to the park. 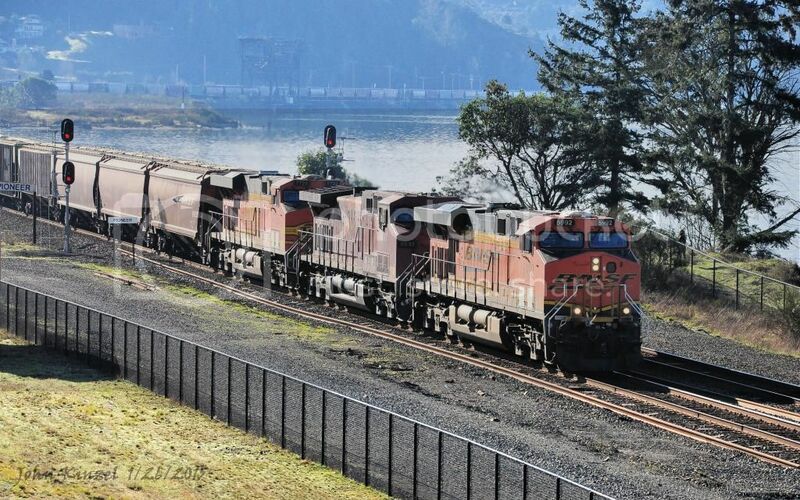 From what I was told by a rail fan, I had missed a NB MTY BNSF grain and while I was there two more MTY's headed north. 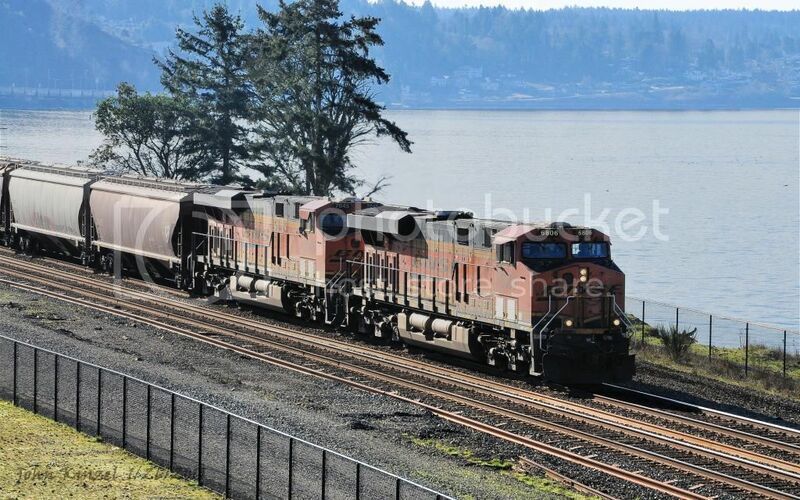 This is the second of three, BNSF 5992 and 7723 with CP 9537 in the middle. And this was number three with two and a DPU. This time of year with the sun as low as it is it makes it tough to shoot northbound trains. North bound Talgo. Looks better in B&W. And last a SB UP grain with a couple of CP units. 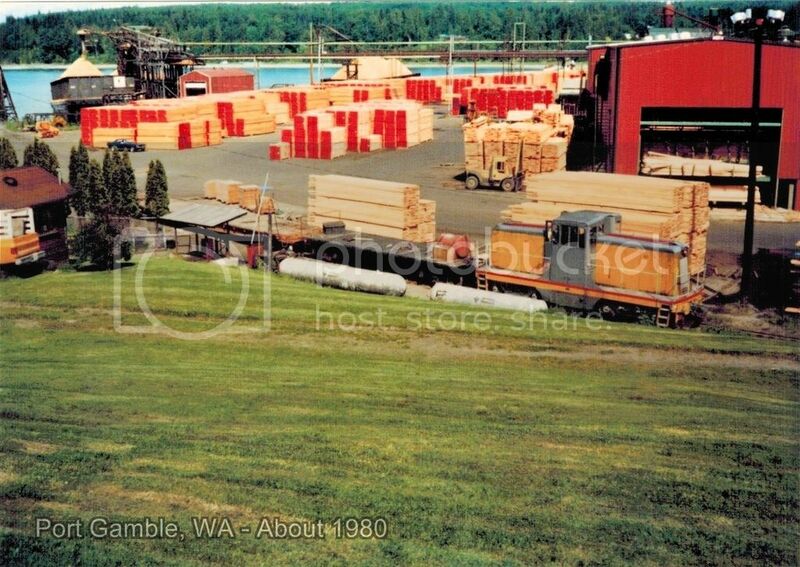 The other day I ran across some photos I had taken at the Port Gamble lumber mill when we had a rail barge in the slip swapping out cars. 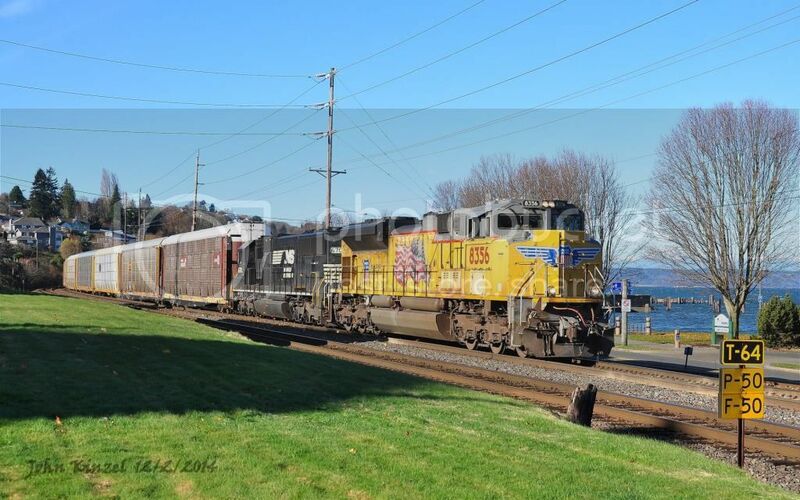 As I looked at them I remember that we never took box cars to Port Gamble, it was always flats or bulkhead flats and I believe all were Union Pacific. Center beams? I can't remember. When these photos were taken the mill was producing half of what it did in its hay day. When I went to work for Foss in 1974 this mill was a going machine. There were three chip loading spouts and at any given time there was a chip barge being loaded at each and an empty chip barge alongside each waiting to take its place. Many a month in those early years I would come to work and we might spend a day in Seattle or Tacoma shifting barges and then get orders to take a loaded chip barge to Port Townsend. Your fate was sealed, you are going to spend the next 13 days of a 15 day trip on the Townsend - Gamble shuffle. Port Townsend is about 19.5 from Port Gamble as the crow flies and has a pulp mill. Towing distance was about 21 miles if you could go through Hadlock Cut (aka Portage Canal) or about 26 miles if you went through Admiralty Inlet. Towing time from Gamble to Townsend with a load, depending on tide, was about 4 to 5 hours from the time you dump wire to secure at the buoy. 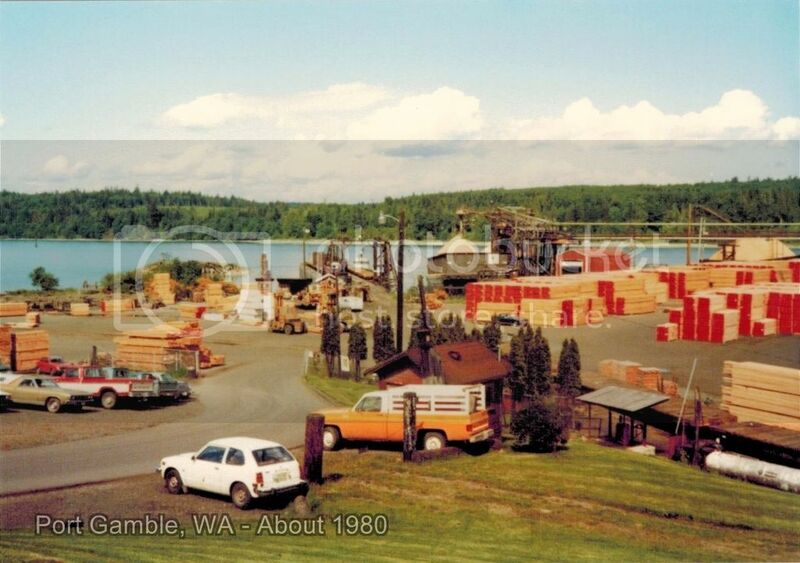 MTY's Townsend to Port Gamble, shift barges, pump barges (back in those days we still had a lot of old wood chip barges and they had to be pumped because they leaked, if not from the bottom, from the top.) Then you would grab a loaded chip barge or two and take them to Port Townsend and hang them on the buoy. Check all the wooden barges for water and pump if needed. Tend the pulp mill, i.e. MTY's out to the buoy, loads into the mill. Then grab an MTY chip barge and back to Port Gamble and do it all over again. woo-hoo, day one down, 12 more to go. Guess I got off topic and I haven't even had a scotch yet. These were taken 35+ years ago and I don't have any information on the little GE or whatever became of it. With the center and starboard tracks loaded and waiting to load the port side. Sure puts a list in the barge and a twist in the ramp. Always kind of spooky. Nice post. Looks like it was a good day for skylarking around--or were you going to town for supplies. 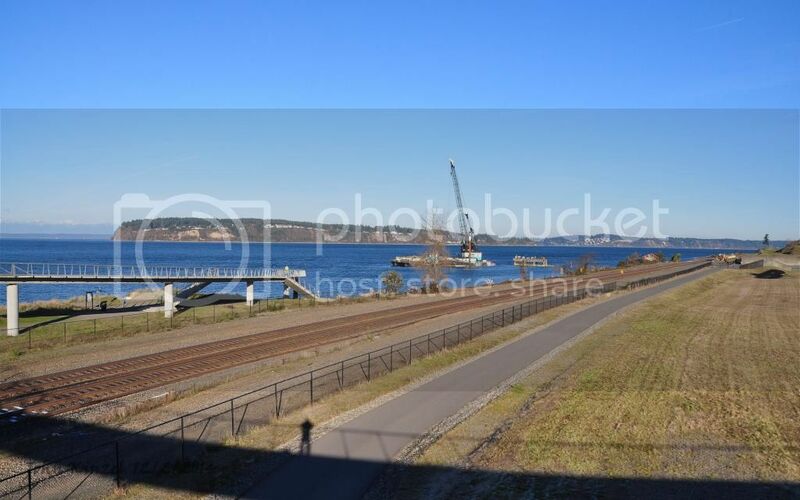 The photo with the listing barge is interesting. I'm guessing there were never any untoward incidents, and that it was not worth the little extra effort to shift the barge two tracks over and load the other outside track before loading the center track. What does the "gantry" structure at the end of the dock do? I looked at Port Gamble on Google Earth and see that even though the tracks appear to be gone, there is still something going on with some logs. Thanks for digging those up. What else do you have squirreled away that you could post? There is a small GE unit (44 Tonner?) and a string of cars sitting on the old Milwaukee RoW beside US 101 near Discovery Junction. The diesel and cars are painted to advertise something. 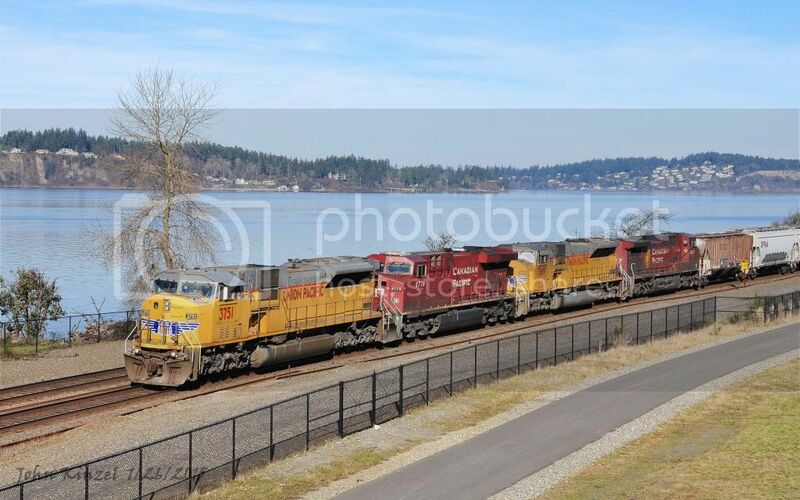 I wonder if that is the Port Gamble GE unit. I believe you are referring to the chip loading dock, (just to the right of the rail slip) there is a barge loaded heavy on one end. There are two loading shoots, one on either side if the structure with the barge on the north/left side. There is also a loaded chip barge on the right side of photo. They would use BB winches to move the barges as required for loading. Usually a barge would be loaded in 24 to 30 hours. Sawdust barge about the same, maybe a little longer. Hog fuel barges were maybe 2 to 3 days. Hog fuel is bark and small wood scraps used as fuel in the boilers at the Crown Z mill in Port Townsend. All of this frantic work didn't come without some down time. After we would get Port Townsend we checked all the barges at all seven buoys (2 barges to a buoy) and if the mill didn't need anything right away we might have several hours of down time. Sometimes we might spend two days at Port Townsend before we got back to Gamble. Loading the rail barge seemed to change based on the person in charge, location and which barge it was. 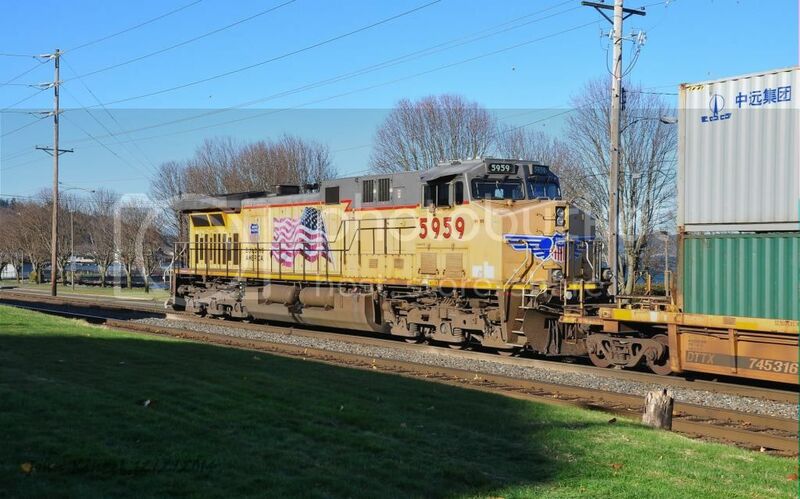 In Port Gamble space was limited for cars in the "yard" such as it was, so it was customary to pull the center track MTY's off and backload before moving to the next track. In Seattle they pulled all the loads before back loading MTY's. They also had a three track apron so we didn't have to shift the barge for each track. 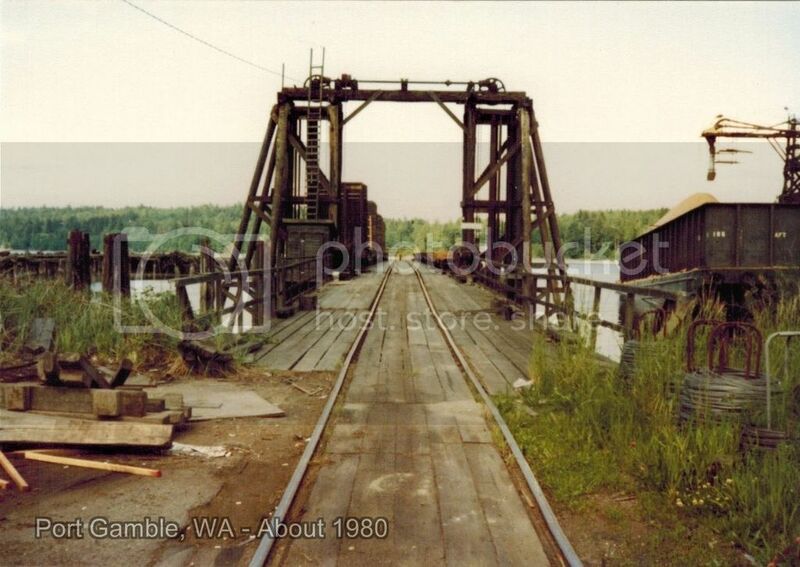 Did Port Gamble have a short run of track just for the mill, or was there more logging railroads at one time? 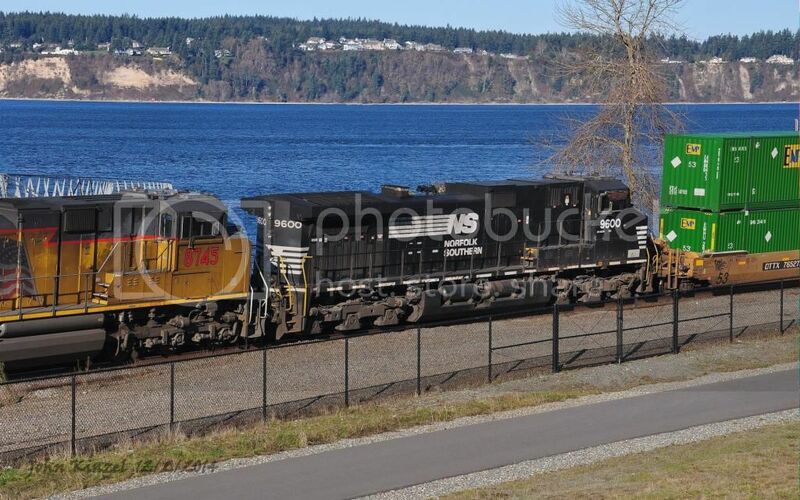 Somehow I had the impression that Kitsap Peninsula might have had at lot more rails way back when. All that's left now services the US Navy. 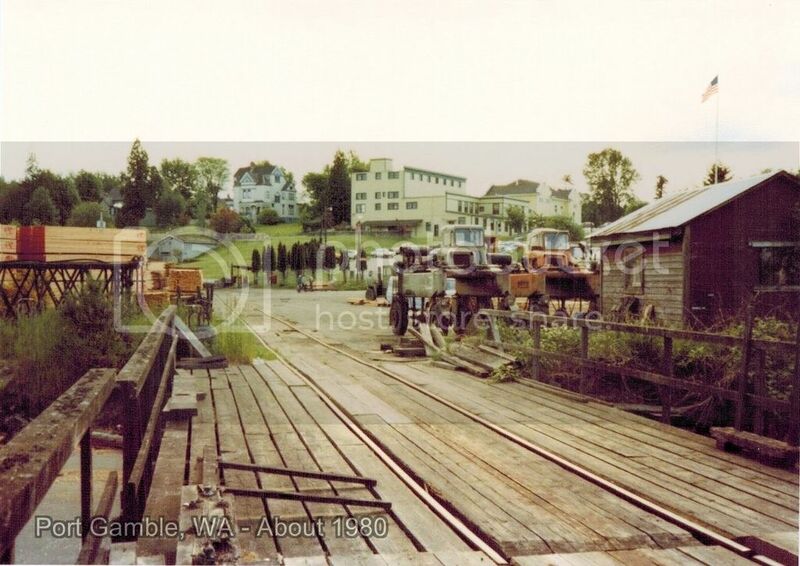 Port Gamble was a mill only railroad. To the best of my memory, they would pull the cars off the barge and then shove them to the open area in the left side of the 1st photo and that was the extent of their track. As for other logging railroad in the area, I'm sure there were a few small early operation and I would guess short lived. Bill, I looked on Google maps satellite and street view around Discovery Jct., but could not find any sign of the engine or cars and I haven't been out that way in 15 or more years. Maybe it's time for trip to La Push or Kalaloch Lodge. 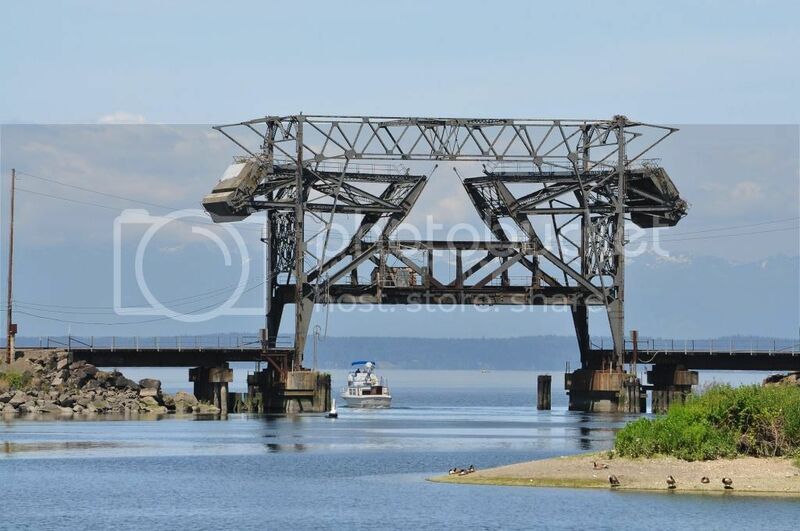 Apart from the Alaska ferry run, how many railcar barges are still operating in Puget Sound, Canadian waters included? I'm thinking Vancouver Island may still have two. 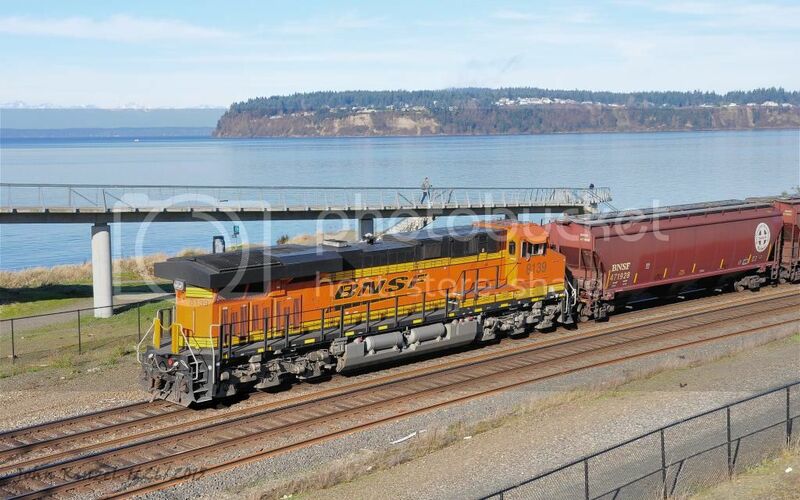 The last local rail barge to fold was the old MILW Seattle to Port Townsend run and I believe it ended about 1983. Maybe the Seattle to Port Gamble run might have had a few trips in 1983 and "maybe" one or two in 1984, but I'm guessing based on some pretty foggy memories. As for Canada, I honestly don't know, but my best guess is they still go from North Vancouver to Nanaimo. What are the two you were thinking of? 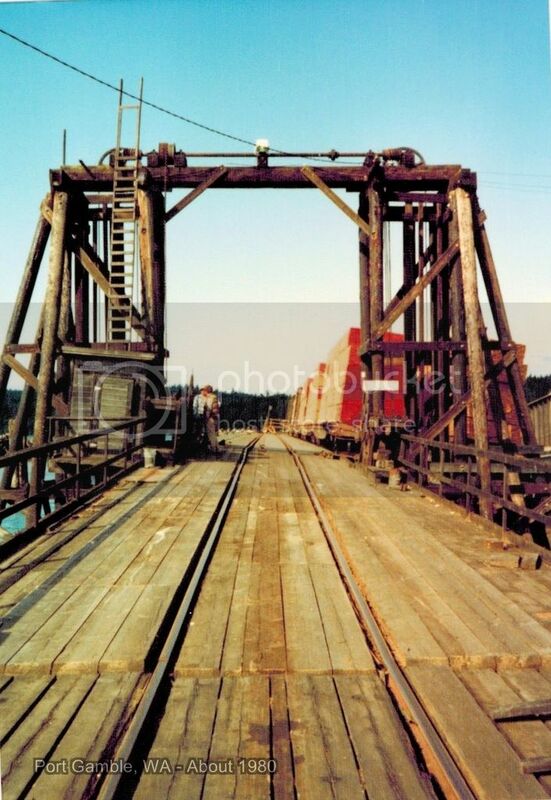 The article states this is the last logging railroad operation in North America. Google Earth map images are not good, but there seem to be cars loaded with timber lined up at Beaver Cove. I don't see information in the article about how product is currently moved off the island, either as raw logs or cut lumber. It had a tourist operation with a steam locomotive in the 90s, but that is not now active. The operation at the southern end of the island was the other one I definitely knew about. 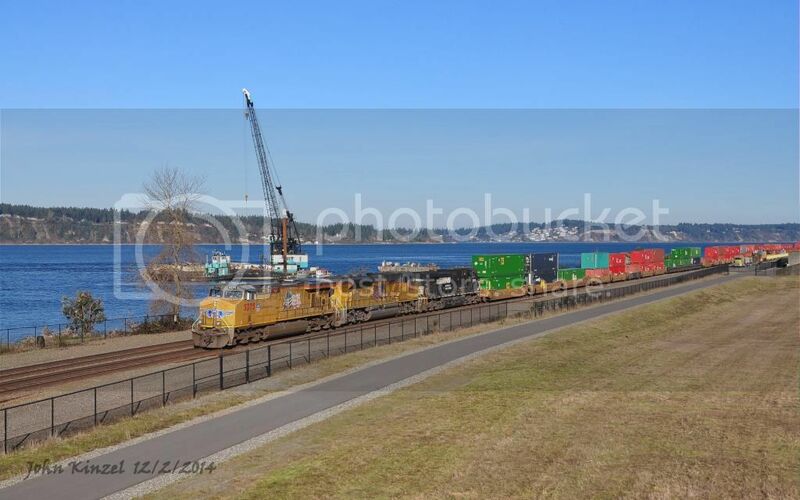 On a visit to Vancouver back in the 90s I rode a ferry across the harbor and back, spotting several railcar floats but this was apparently interbay operations, not across the Sound. This Google Maps image shows a lot. No mill and no rail slip. I think what you might be seeing are loaded log cars. It looks like most of the wood departs by rafts/log tow and they may also take a lot out on log barges. All depends on the final destination.